If you are new to Shalom San Miguel's Shabbat morning worship service, one of our members ought to greet you at an appropriate time during or after the service. If you are not greeted, please identify yourself after services to the person who conducted services. Our religious services are traditional/ egalitarian, based on a Conservative model. We are lay-led and our community is very inclusive; services are mostly in Hebrew with complete English and Spanish translation and transliteration. We have plenty of enthusiastic singing and opportunities for participation. Even if you are only here for a short vacation, we want you to feel a part of our community! If you are a Jewish adult, please identify yourself so that we will be able to include you in the minyan. It is a mitzvah to help make a minyan. Men are invited to wear a tallit if it is their custom, and to please cover their heads. Yarmulkas are provided for this purpose. If you have any skills to offer, such as reading Torah, leading services, teaching classes or leading a Torah discussion group, please volunteer, even if you’re only here for a short time. If you are observing a Yahrzeit or are in a period of mourning, please let us know so we can acknowledge you when we say Kaddish near the end of the service. We normally read a short Torah portion, and have a group aliyah for all participants. We enthusiastically welcome you to our service and Torah study. We ask that you are respectful and that all men wear a skullcap (yarmulka) that you will find in a basket by the entrance. A prayer shawl (tallit) is not usually worn by non-Jews. Please turn off your cell phones and kindly refrain from taking photographs in the sanctuary. You are invited to the Kiddush after the service. Wine or juice, bread and sometimes light snacks are served. Our prayer books are available for purchase as are commemoration cards and lavers (handwashing cups). Please see a Board member for these, as well as to discuss other donation and participation opportunities. 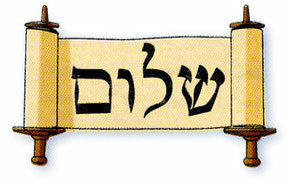 Torah Study follows Kiddush, an opportunity to discuss the weekly parashah (Torah portion) in depth. You are welcome to participate in this group. Shalom San Miguel is a volunteer organization dependent upon the generosity of members and guests. Although it is not customary to handle money on Shabbat, we welcome contributions. Please take an envelope, which you may leave in our Tzedakah box or at La Conexión, Aldama #3, box 613A. We hope you’ll be generous.